I was born in 1947 to a nice middle-class family in Malvern, Victoria. As a child, I was always in trouble for reading too much. Hiding under the covers with a torch, I ignored my grandmother’s dire warnings that I’d ruin my eyes as I worked my way through the Famous Five and the Faraway Tree, progressing to Biggles and Mary Grant Bruce’s Billabong series. Reading led to writing. My first published piece appeared in Teenager’s Weekly, a supplement to the Australian Women’s Weekly, in 1963 while I was still at school. That year, tossing up between journalism and copywriting and not fancying being consigned to the social pages, I decided that the world of advertising was less likely to discriminate against women. I took my first job in advertising during Australia’s “Mad Men” era, the mid ‘60s, and became a full-time copywriter in 1969. Starting with Kmart catalogues, I worked my way up to national campaigns for ice cream, lollies, beer, yoghurt, biscuits, soup and a multitude of other products and services. In 2001 my advertising work even won me a medal, awarded for my ‘Contribution to the Centenary of Federation’ – a campaign that taught Australians the name of their first Prime Minister. In between jobs I travelled overland from Kathmandu to the UK, lived and worked in London, covered 32,000km in a trek around Australia and fell in love with Italy and its food. 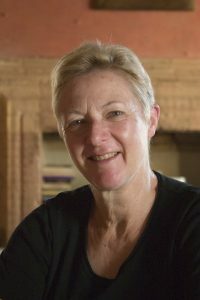 In 2005 I collaborated with my husband on the launch of a glossy magazine, Regional Food Australia, writing columns, articles and reviews and casting an editorial eye over the publication. I also continued in my day job writing advertising, which was fortunate as the magazine folded for lack of funds after three issues. Well, it was fun while it lasted. My first book, Me and My Big Mouth, was a self-published food memoir that traced the revolution in Australian food during the baby boomers’ lifetime. This led to a website – Australian Food History Timeline – which has continued to expand over the past few years. The timeline itself has now given rise to a new book – A Timeline of Australian Food: from mutton to MasterChef – released by New South Publishing in late 2017. This book is a popular history that covers 150 years of Australian food – from the first-ever Australian cookbook in the 1860s to the arrival of ‘food reality’ television in the 2000s. After living and working in the Canberra region for 18 years, I now live in inner Melbourne. I’m still doing commercial work, developing content for social media and websites and waxing lyrical about lots of property developments. This website still contains a lot of writing about food, but has been split off from the timeline site so I can write about other things too. Maybe even try my hand at fiction. Now that’s a scary thought. Stay tuned.